There is a step at the beginning “Confer” where Betty talks with the patient to gather information on how the patient feels and what problems are presenting. Then there is a step which is involves running some further tests, which might be done by the doctor or by other people who specialize in tests, like a MRI, CT Scan, or blood tests. After than there are a large number of treatments, maybe 50 or 100 of them. Betty will weigh the evidence and determine that a particular treatment should be tried. Betty will refer the patient to the specialist by assigning the treatment task to the referred doctor. The system will take over from there. Charles is the back care specialist to whom the patent, Alex, is being referred. Before Charles can do anything, he must be introduced to Alex, and he must be introduced to the task. Let’s call what is happening here “Task Introduction“. 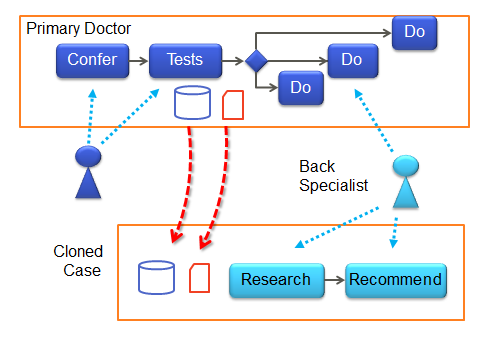 Many simplistic treatments of business process consider task introduction to be outside the scope of the business process. Tasks are assigned the minimal of explanations: “Approve Expense Report” assumes that the performer of this task knows what needs to be done, and those additional details of what must and must not be approved is learned through a completely different channel. Task Introduction then includes everything from when Charles first learns that there is something to be done, until when he understands what he is being asked to do. Basic notification can be accomplished with an email message. Charles might then follow a link to a web UI that contains additional detail about the patient, the doctor, and the test results that have already been produced. 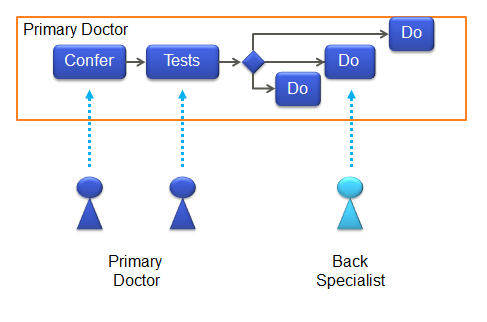 As Pictured above, Charles might interact directly with the case system of the primary care doctor. This would certainly be the case if these doctors worked for the same company, but in this scenario they don’t. Instead, Charles clones the case instance. Case cloning is when a local case is made that matches the remote case, and contains a copy of the accessible contents of the remote case. Why would Charles want to do this? Because Charles does not have rights on the remote case to make changes there. If he has his own goals he wants to perform, such as “research” and “recommend” as shown,then he needs a place to manage those goals. Where does the Personal Assistant come in? Receiving and screening notification – if Charles gets a lot of requests to do task, those emails can go to the personal assistant which can filter for interesting tasks. Task Introduction – pick up additional information about the task to evaluate using a set of rules whether this task is interesting. Task Acceptance – sending a notice back to the sender that the offer is interesting and going to be considered by a human. Determine the Right Template – again based on rules, and start the process if necessary. Is that all? Why give this the trumped up name of personal assistant? The reason is that this piece of software is “acting on Charles’ behalf” which is what personal assistants do. The task was assigned to Charles, but the personal assistant picked it up. The personal assistant might actually do some negotiation, perhaps clarifying the terms. The personal assistant is bridging from the Charles’ environment, working for Charles, and reaching over to act on Betty’s environment. The personal assistant might react by directly taking action on the remote system based on rules. Or it might as pictured do some ground work for Charles by setting up an environment for Charles to complete the work in his own way. This is precisely where you need personal assistants to take action. Isn’t this just a Subprocess? It would just be a subprocess if it was designed from the beginning to fit together by a single designer. In the next post I will talk about the problems that arise because the system that Betty uses is designed by one company, and the system that Charles uses is designed by someone else. The personal assistant has a critical role in getting these to work together. 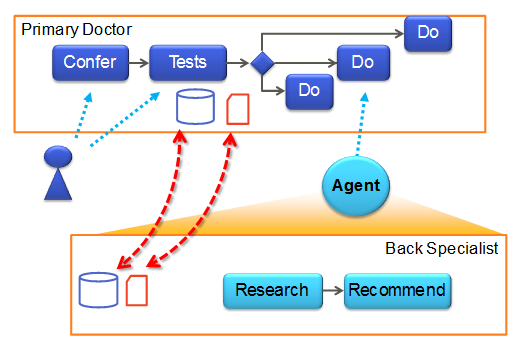 This entry was posted in Adaptive, Adaptive Case Management, Workflow and tagged agent, distributed, federated process. Bookmark the permalink. Nice article, this really changes the way we look at personal assistants responsibilities.